We Bengali's are very passionate about Durga puja. This is our main festival. This goes on for number of days but the most important day during Durga puja is the 8th Day, we call it "Astomi" or "Durgastomi"and one of the things that almost every Bengali eat on this day is Luchi . 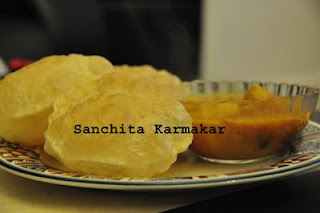 Luchi or Puri is a actually a deep fried bread made out of plain flour. Mix the salt and the flour well then add 1 tbsp of oil and mix it well in the dry flour. Now add the water in to the flour and knead well to make a dough. Make small balls out of the dough. Now dip the balls corner in to oil and roll it with a rolling pin. This makes the rolling of the luchi easier. Heat the oil in a deep bottom pan. You need to deep fry the luchis so pour enough oil in to the pan. When the oil is very hot fry the luchis one by one. As soon as you drop the luchi in the oil try to remove oil from the top surface of the luchi, so that it can blow up. Fry on both side for few seconds then drain the oil and keep it aside. 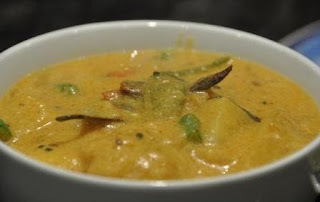 Serve hot with any curries. As you can see in the picture I have served with Dum Alu. OK! So, I will start with the sweet/dessert recipes. The first one is suji halwa. 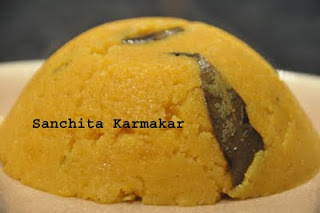 This is a very easy and quick recipe to make and very tasty as well specially if you have a sweet tooth. So here we go. Dry roast the semolina until the sweet aroma comes out of the semolina and it turns light brown. Remove it from the heat and set it aside. Heat the ghee/butter now, fry the cashew nuts and set aside. Add the bay leave, cardamom to the remaining butter and fry for a while now add the roasted semolina and mix well, then add the sugar, milk and the water and keep mixing until you get a homogeneous mixture stirring it continuously. Now add the raisins and the fried cashew nuts and mix well. Serve hot. Optional : you can add little bit of orange food colour or a bit of saffron diluted in the warm milk. This will give a different dimension to the dish. 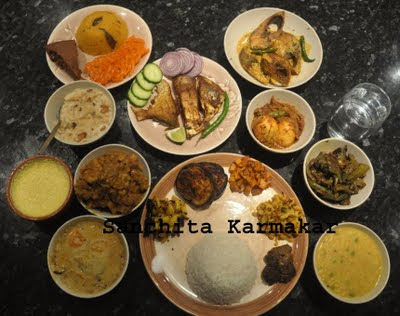 This is a special Bengali meal I cooked on a very special occasion. It was my husband's birthday and I ran out of ideas to get a gift for him. him with a big fat Bengali meal. representative dishes as possible. Also I had to keep in mind that my husband could eat or at least be able to taste all the items I cook J so what I did was picked the items I could get in our local Indian grocery store and cook the meal. It took me two evenings to prepare this meal. Here is a list of items that I have in the photo above. Soon I will start uploading the recipes (the ones I cooked) as well. Heat the oil and fry the peanuts. Once the peanuts are done remove them from the oil and keep aside. Now add urad dal, curry leaves (if you don't get fresh use the dried ones), mustard seeds to the remaining oil and fry for a minute. Next add the onion, green chillies, ginger, mixed veg, coriander powder, cumin powder and salt and keep frying until its done. Now add the semolina, mix it well with the veg and add the water. Keep stiring so that it doesnot form any lump. Add more water if required. Cook for another 2 minutes. 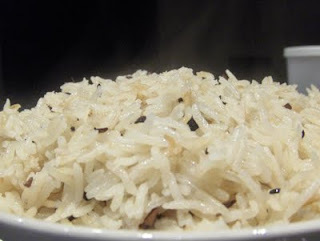 Wash the uncooked rice and let it dry. Heat the ghee or oil in a pressure cooker, add all the whole spices and fry for a while. Now add the rice and keep frying for a minute or two. Add water and salt. Stir it well and close the lid of the pressure cooker. Wait till 2 whistles and turn the heat off. Wait till the pressure is release. Serve hot with any curry. Melt the butter and add the beaten egg in it and mix well. Mix all the dry ingredients and add to the butter and egg mix. Now add the milk and mix everything well to a homogeneous mixture. 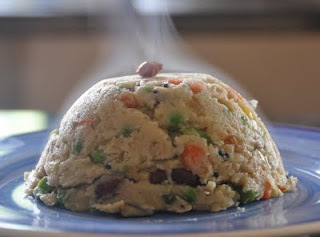 Heat a nonstick pan and drop spoonful of the mixture in to the heated pan (no oil or butter required). Cook till the small little bubbles appear on the top of the pancakes. Turn the pancakes and cook the other side. Serve hot with cold maple syrup. Heat the oil in a pan. Cut of the top part of each capsicum and remove the seeds. Fry them turning frequently for few minutes and then remove from heat. Now add the cumin seeds in the remaining oil (add a bit of oil if required), fry for a bit and then add the onion and the tomatoes and the chopped chillies. Cook till the onions are done, now crack the egg (optional, you can skip the egg if you want) in the pan and mix well with the onions and continue frying. Now add salt, peas and the cooked rice. Stir well and cook for 3-4 minutes and remove from the heat. Now fill the capsicum with this mixture and serve hot. Add the sugar into the yogurt and mix well. Now add rest of the ingredients and mix well. 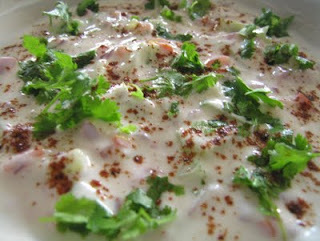 Serve cold with stuffed paratha or biriyani. Heat the oil in pan. Add all the spices and the onions and fry for a while. Once the onions are done add the baked beans and cook for 2-3 minutes. Add a bit of water if required. Keep stirring so that it doesn't stick at the bottom. Serve hot with toast. Mix all the ingredients well (other than oil) then add water to it and knead it well. Cover and keep for 30 minutes. After 30 minutes knead it again for a minute and then make small balls from it. With a rolling pin roll them, use dry flour to avoid sticking. 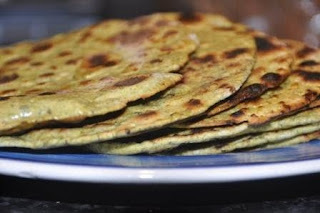 Heat a frying pan place the paratha on it and cook from both side. Now spread some oil on top of the paratha fry for a bit and then remove from the heat. Serve hot with any curry or yogurt and pickle. Heat the oil in a pan, and add the dry red chilli, panch phoron, bay leaves, cardamom, cloves, cinnamon and asafoetida. Cook for a minute then add the onions and fry till golden brown. Now add the turmeric, salt, red chilli powder, tomatoes and the potatoes and mix well. Cover and cook for 2 min. Now add enough water to submerge the potatoes. Cover and cook it over low heat till the potatoes are done. Now add the beaten yogurt to the potatoes and mix well. Bring it to boil. 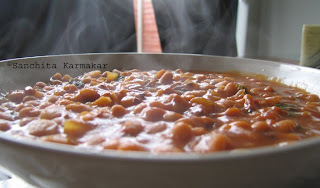 Serve hot with roti/parathas.